Nat “King” Cole’s enormous success as a vocalist overshadows the fact that he was a highly respected jazz pianist who inspired musicians such as pianist Oscar Peterson and bassist Michael Moore. Cole grew up in Chicago amidst many opportunities to hear live jazz, and the budding pianist stood outside the clubs and listened, especially to Earl “Fatha” Hines who was revolutionizing jazz piano. As a teenager he took his band into the Savoy Ballroom and bested Hines’ group in a cutting contest. Born Nathaniel Adams Coles in Montgomery, Alabama, on March 15, 1919, he was four when the family moved to Chicago. His father was a Baptist preacher, and his mother, a choir director, passed on her love of music to the children. Nat’s older brother Eddie was a professional bassist and his youngest brother, (Lionel) Freddy, is a renowned pianist/vocalist. Nat received formal music education, played organ in the church, and turned professional in his teens, dropping the “s” from his last name. In 1937 Nat was touring with Shuffle Along when the company was stranded in California. 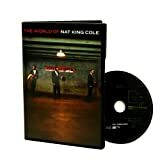 He stayed on the West coast, put together his first trio with guitarist Oscar Moore and bassist Wesley Prince and was crowned “King” Cole after the nursery rhyme. Cole had begun singing with the trio, and their 1939 recording of “Sweet Lorraine” brought attention to the group. In 1943 they recorded Cole’s “Straighten Up and Fly Right” for fledgling Capitol Records, and by 1944 it was a million-seller. The theme of the song was taken from one of his father’s sermons. Unfortunately, Cole had sold the song to music publisher Irving Mills for $50 with no royalty rights. The trio, with Cole’s vocals, was hitting the charts--“Frim Fram Sauce,” “Route 66,” “For Sentimental Reasons,” and “The Christmas Song.” His 1948 recording of “Nature Boy” reached gold status, and he began to focus on his vocal career, now calling the group Nat King Cole and the Trio, with the addition of a drummer. In the early ‘50s Cole’s troubles with the IRS no doubt prompted him to cover more pop material to the chagrin of jazz fans. In 1955 he disbanded his trio although he brought them together with guest stars in 1956 to record the jazz-oriented After Midnight. The fifties produced such hits as the Academy Award winning “Mona Lisa,” “Too Young,” “Walkin’ My Baby Back Home,” and “Unforgettable.” He had a radio show, appeared in films, and hosted his own TV show. Despite the show’s popularity and Cole’s elegant presence, sponsors were reluctant to support a black host. The international star continued to follow a rigorous schedule of personal appearances and recordings until he was diagnosed with cancer in 1964. He died on February 15, 1965, just short of his 46th birthday.